The canoe is a light watercraft invented by the natives of Everique and used by almost every indigenous nation with adaptations depending upon the available resources. The most common canoes of northern Everique are the birchbark canoes. They are light, fast, maneuverable, and surprisingly rugged. They can carry enormous amounts of cargo, even over shallow water. The Saronnans quickly ditched their heavy rowboats in favor of the canoe, which is well suited for the Everique wilderness. The birchbark canoe is built from birch bark stretched over a wooden frame (usually cedar). Not only is birch bark strong and flexible, but it contains oil that makes it highly water resistant. Birch trees are ubiquitous in northern Everique, making them an easily available resource, and their bark can be cut from the trunks in long, curling strips. The birchbark is then sewn together with watap, which is made from the roots of the spruce tree. The seams are then caulked with tree resin. 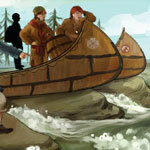 The voyageurs and coureurs des bois use two different types of canoes. The most common is the Canoe of the North. They are about 8 meters (26 ft) in length and more than 1 meter (4 ft) in width. They have a crew from four to eight, and can carry 1,500 kg (1.5 tons) of cargo. These nimble vessels can ply all put the shallowest of rivers, but they must be careful on rapids. The larger Master Canoes are 11 meters (36 ft) in length and are about 2 meters (6 ft) in width. They have a crew of six to twelve and can carry 3,000 kilograms (3 tons) of cargo. They are used on the Sweet Seas and primary waterways such as the Grande Vire, but are too large for the smaller rivers. Even these large canoes must beware the great storms that hurtle across the Sweet Seas in the late autumn. A travois is a wooden frame that is a way of transporting large goods over land without the use of a wheel. To create a travois, two poles are lashed together at one end and are positioned so that they spread apart, creating a triangular area between them. A third pole can be lashed across the wide end of the travois for stability, but mostly blankets and netting are stretched between the poles to form a platform for goods. An individual can then step inside the narrow end and drag the travois along. A travois can also be strapped to the back of a dog. With the arrival of the horse in Everique, larger travois are now possible, carrying mighty loads. Although looked down upon by engineers from Japethe, travois are a practical and efficient way to transport goods in northeastern Everique. The deep snow, heavy woods, and rocky land make wheeled vehicles difficult to use, except on prepared roads, which are few and far between in the wilderness. A travois can be made with branches, bark, and vines, making it a readily available method of transporting goods that can be made on the spot. The travois was invented and heavily used by the native tribes of Everique and adopted by the voyageurs and coureurs des bois that venture into the wilderness.